Looking north towards Ivanpah Facility's eastern boiler tower from Interstate 15. Units 2 and 3: 133 MW each. The facility, costing $2.2 billion was developed by BrightSource Energy and Bechtel. The largest investor in the project was NRG Energy which contributed $300 million. Google contributed $168 million. The United States government provided a $1.6 billion loan guarantee and the plant is built on public land. In 2010, the project was scaled back from its original 440 MW design to avoid disturbing the habitat of the desert tortoise. The bright spots of Ivanpah are clearly visible from above Las Vegas and further. 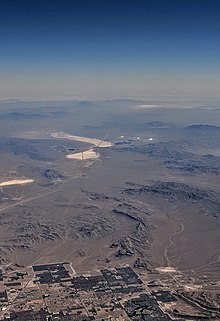 The Ivanpah system consists of three solar thermal power plants on 3,500 acres (1,400 ha) of public land near the California–Nevada border in the Southwestern United States. Initially it was planned with 440 MW gross on 4,000 acres of land, but then downgraded by 12%. It is near Interstate 15 and north of Ivanpah, California. The facility is visible from the adjacent Mojave National Preserve, the Mesquite Wilderness, and the Stateline Wilderness. Fields of heliostat mirrors focus sunlight on receivers located on centralized solar power towers. The receivers generate steam to drive specially adapted steam turbines. For the first plant, the largest-ever fully solar-powered steam turbine generator set was ordered, with a 123 MW Siemens SST-900 single-casing reheat turbine. Siemens also supplied instrumentation and control systems. The plants use BrightSource Energy's "Luz Power Tower 550" (LPT 550) technology which heats the steam to 550 °C directly in the receivers. The plants have no storage. Final approval for the project was granted in October 2010. On October 27, 2010, Governor of California, Arnold Schwarzenegger, Interior Secretary Ken Salazar, and other dignitaries gathered in the Mojave Desert to break the ground for the construction. The project, which had a total cost of about $2.18 billion, received a $1.6 billion loan guarantee from the United States Department of Energy. The facility developed contracts to sell about two-thirds of the power it generated to the Pacific Gas and Electric Company (PG&E), and the rest to Southern California Edison (SCE). The largest investor in the project was NRG Energy, a generating company based in Princeton, New Jersey. It contributed $300 million. The project also received an investment of $168 million from Google. However, in November 2011, Google announced that it would no longer invest in the facility due to the rapid decline of the price of photovoltaic systems. $90,000,000 in financing was provided through the EB-5 Investor Immigration program, managed in this case by CMB Regional Centers. Ivanpah's eastern tower online. Note the sunlight glare on either side of the boiler. A severely underexposed close-up of one of the boilers. Solar towers in full operation. The plant burns natural gas each morning to commence the operation. The Wall Street Journal reported, "Instead of ramping up the plant each day before sunrise by burning one hour’s worth of natural gas to generate steam, Ivanpah needs more than four times that much." On August 27, 2014, the State of California approved Ivanpah to increase its annual natural gas consumption from 328 million cubic feet of natural gas, as previously approved, to 525 million cubic feet. In 2014, the plant burned 867,740 million BTU of natural gas emitting 46,084 metric tons of carbon dioxide, which is nearly twice the pollution threshold at which power plants and factories in California are required to participate in the state's cap and trade program to reduce carbon emissions. If that fuel had been used in a Combined Cycle Gas Turbine (CCGT) plant, it would have generated about 124,000 MW·h of electrical energy. The facility used that gas plus solar energy to produce 524,000 MW·h of electrical energy (more than four times that of the referenced CCGT plant), all the while operating at well below its expected output. In 2015, the facility showed higher production numbers, with Q1 increases of 170% over the same time period in 2014. In 2015, the natural gas consumption had decreased to 564,814 million BTU, while the total energy output had increased to 652,300 MWh. The facility uses three Rentech Type-D water tube boilers and three night time preservation boilers. The California Energy Resources Conservation and Development Commission approved for each a stack "130 feet high and 60 inches in diameter" and consumption of 242,500 ft3/h of fuel. BrightSource estimated that the Ivanpah facility would provide 1,000 jobs at the peak of construction, 86 permanent jobs, and total economic benefits of $3 billion. Elected San Bernardino County Supervisor, Brad Mitzelfelt, who represents most of the California Mojave Desert stated that the "project would create jobs for mostly Las Vegas and electricity for mostly San Francisco". The project received a $1.6 billion loan guarantee from the United States Department of Energy. According to Synapse Energy Economics, the estimated construction cost for the facility of $5,561.00 per kW fell between that of coal and nuclear power plants. but this does not account for the less favorable capacity factor of solar power. In November 2014, the facility's investors applied for a $539 million federal grant to finance their federal loan. Contracted power-delivery performance of 640 GW·h/year from Units 1 and 3 and 336 GW·h from Unit 2 was met by 2017, following sharply reduced production in the first few years of operation, particularly in the start-up year of 2014. In November 2014, the Associated Press reported that the facility was producing only "about half of its expected annual output". The California Energy Commission issued a statement blaming this on "clouds, jet contrails and weather". Performance improved in 2015 to about 650 GW·h. However, NRG Energy said in its November quarterly report that Ivanpah would likely not meet its contractual obligations to provide power to PG&E during the year, raising the risk of default on its Power Purchase Agreement. PG&E had a contract to receive 640 GW·h/year from Units 1 and 3, while SCE was supposed to receive 336 GW·h from Unit 2, at a price of about $200/MW·h (20¢/kW·h). In March 2016, PG&E agreed not to declare the plant in default for at least four months in return for an undisclosed sum from the owners. In June 2015, The Wall Street Journal reported, "15 months after starting up, the plant is producing just 40% of [its expected more than a million megawatt-hours of electricity each year], according to data from the U.S. Energy Department." Performance improved dramatically in the second year. CleanTechnica reported with respect to units 1 and 3 that "in 2015, PG&E customers received about 97% of Ivanpah’s contracted electrons, which is a massive improvement over its first year". By 2017, due to improvements, the plant was meeting the contract output requirements. The steam plant was designed for 28.72% gross efficiency. The local irradiance near the area is about 7.4 kW·h/m2/day (annual average) for a total solar energy flow in the visible spectrum of 2.717 MW·h/m2 yearly. One heliostat mirror is a 75.6 square feet (7.02 m2) reflecting surface, giving a total of 151.2 square feet (14.05 m2) per heliostat. The total plant heliostat reflecting surface results in 173,500 heliostats × 14.05 m2/heliostat = 2,437,144 m2. Based on irradiance, the intercepted solar energy flow is 2.717 MW·h/m2/year × 2,437,144 m2 = 6,621,720 MW·h yearly. Thermal yield, after taking into consideration reflection, transmission, radiation and absorption losses, assumed about 55 percent, resulting in a thermal power input to the steam turbines of 6,621,720 MW·h × 55 percent = 3,641,946 MW·hth. The resulting expected energy output would be 3,641,946 MW·hth × 28.72 percent efficiency = 1,045,967 MW·h/y, rounding up to 1.05 TWh/y. The overall energy conversion efficiency = energy output / intercepted solar energy = 1,045,967 MW*h/yr / 6,621,720 MW*h/yr = 0.15796 or less than 16 percent. These calculations are theoretical, because the facility is lacking a storage system, and each night it cools, requiring a preheating ramp-up step each morning. If the preheating is made with natural gas the estimated values are possible. On May 19, 2016, a small fire was reported when misaligned mirrors reflected sunlight into a level of Unit 3 tower not designed to collect power, requiring the tower to shut down for repairs. As another of the three power-generating units was already offline for scheduled maintenance, the plant was left with only one third of its installation functional. Unit 3 resumed operation on June 8, 2016. All three units were back in operation by June 20, 2016. Solar thermal electricity production in California peaked at 703 MW on that day, up from 452 MW on June 7 when two units were offline. In August 2014, Ivanpah was awarded the "Plant of the Year" award from POWER Magazine. In February 2012, Ivanpah was awarded the CSP (Concentrating Solar Power) Project of the Year by Solar Power Generation USA. The project generated controversy because of the decision to build it on ecologically intact desert habitat. The Ivanpah installation was estimated, before operations started, to reduce carbon dioxide emissions by more than 400,000 tons annually. It was designed to minimize impacts on the natural environment compared to some photovoltaic solar facilities because the use of heliostats does not require as much grading of the land. The facility was fenced off to keep out some terrestrial wildlife. However, birds faced the risk of collision with the heliostat mirrors or from burning in solar flux created by the mirror field. In 2012, the National Parks Conservation Association (NPCA) issued a report on the project, citing water concerns, damage to visual resources, and impacts on important desert species. To conserve scarce desert water, LPT 550 uses air-cooling to convert steam back into water. Compared to conventional wet-cooling, this results in a 90 percent reduction in water usage. The water is then returned to the boiler in a closed process. Another potential issue is the effect of mirror glare on airplane pilots. Additionally, "the power towers have 'receiver units' at their top on which the mirror fields focus their reflected light. During operation, these receiver units become extremely hot, such that they glow and appear brightly lit. ... Because they are high above the ground, these glowing receiver units will be a visible distraction to persons at many of the KOPs [Key Observation Points], including travelers utilizing I-15." According to the State of California Energy Resources Conservation and Development Commission Opening Briefs regarding this project, "the project itself is visually imposing. It would cover roughly 4,000 acres (1,600 ha), most of which would be covered with mirror fields. The panoramic expanse of mirror arrays would present strong textural contrast with the intact, natural character of the desert floor [and] would rise to a height of roughly 459 feet [140 m]; an additional 10 to 15 feet [3.0 to 4.6 metres] above that height would consist of lighting to meet Federal Aviation Administration (FAA) requirements." The Ivanpah Solar power project was built on six square miles of public land in the south central Mojave Desert. Project construction was temporarily halted in the spring of 2011 due to the suspected impacts on desert tortoises. Construction resumed when the United States Fish and Wildlife Service (USFWS) found the project was not likely to jeopardize the endangered desert tortoise. BrightSource also installed fencing to keep wildlife out of the area. In 2010, the project was scaled back from the original 440 MW design, to avoid building on the habitat of the desert tortoise. Many desert tortoises found on the site were relocated to other parts of the Mojave Desert. However, environmentalists raised concerns that relocated tortoises were more likely to die due to the stresses involved. During the trial of the plant in September 2013, thirty-four dead birds were found at the plant. Fifteen had heavily burned feathers, which staff at the plant referred to as "streamers" because they were burned in flight by the intense radiation from the heliostat mirrors. From February through June 2014, a team of biologists monitoring the number of bird deaths reported a total of 290. In April 2014, the USFWS reported that 141 dead birds, including peregrine falcon, barn owl and yellow-rumped warbler had been collected at Ivanpah in October 2013. Forty-seven of the birds' deaths were attributed to solar flux. According to a report by the Associated Press, "Ivanpah might act as a 'mega-trap' for wildlife, with the bright light of the plant attracting insects, which in turn attract insect-eating birds that fly to their death in the intensely focused light rays." Bird kill mitigation strategies were considered, including proven, environmentally safe technologies such as avian radars and LRADs to keep birds away from the site, covering ponds to discourage waterbirds from loitering, and clearing additional land around the plant to make it less attractive and more visible to birds in flight. Some of the bird deaths occurred when the plant was in standby-mode, and the mirrors were focused above the tower. This issue was resolved by spreading the focus wider, below damaging intensity. In April 2015 the Wall Street Journal reported that "biologists working for the state estimated that 3,500 birds died at Ivanpah in the span of a year, many of them burned alive while flying through a part of the solar installment where air temperatures can reach 1,000 degrees Fahrenheit [540 °C]". In late 2015, Brightsource released the results of the first full year monitoring bird and bat deaths at the Ivanpah solar plant. The company reported that during a year of study supervised by the California Division of Wildlife, the number of observed bird deaths, adjusted upward to account for inefficiencies of the carcass-counting, were around 3,500 bird deaths per year caused by the Ivanpah solar plant. The Ivanpah plant took steps to further reduce bird deaths. The initial reports of high avian casualties have been disputed ever since initial reports surfaced. In September 2014, for example, Renewable Energy World suggested "With its claim of 28,000 dead birds from Ivanpah, the Associated Press syndicated a story on every front page in America, spreading alarm about concentrated solar power (CSP) plants, which was not grounded in facts, but on one opponent's speculation." Ivanpah Solar electric production is as follows (in megawatt-hours, MW·h). Ivanpah was advertised as designed to produce 940,000 MW·h of electricity per year, based on its nameplate capacity and assumed capacity factor. In its second year of operation, Ivanpah's production of 653,122 MW·h of net electricity was 69.5 percent of this value, ramping up from 44.6 percent in the first year. In its fifth year, the annual production was 84.7% of its advertised value. Ivanpah Solar use of gas is as follows, expressed in MMBtu as reported. ^ a b Michael R. Blood and Brian Skolof, "Huge thermal plant opens as solar industry grows" Archived 2014-02-22 at the Wayback Machine, Associated Press, February 13, 2014. ^ a b c "Ivanpah Solar Electric Generating System". National Renewable Energy Laboratory (NREL). Archived from the original on 2015-10-12. Retrieved 22 March 2016. ^ a b "Ivanpah". Loan Programs Office (LPO), Department of Energy (DOE). March 2015. Retrieved 2 May 2016. ^ a b c "Brightsource Ivanpah". Ivanpahsolar.com. ^ "Business Wire: Ivanpah Solar Electric Generating System Reaches 'First Sync' Milestone". Businesswire.com. Retrieved 28 November 2014. ^ a b c Wald, Matthew (November 28, 2011). "Google Pulls the Plug on a Renewable Energy Effort". The New York Times. ^ a b La Jeunesse, William (November 8, 2014). "World's largest solar plant applying for federal grant to pay off federal loan". Fox News. investors of a California solar power plant now want a $539 million federal grant to pay off their federal loan. ^ a b Woody, Todd (February 11, 2010). "BrightSource Alters Solar Plant Plan to Address Concerns Over Desert Tortoise". The New York Times. Retrieved 2010-02-25. ^ Walsh, Bryan (24 June 2013). "Tower of Power". Time (paper). pp. Business 1–4. ^ a b c d "Docket No. 07-AFC-5: Energy Commission Staff's Opening Brief" (PDF). California Energy Commission. 1 April 2010. Retrieved 15 April 2010. ^ Siemens. "Energy efficiency. Rethinking the energy system here in the U.S." Usa.siemens.com. Retrieved 28 November 2014. ^ a b c d BrightSource & Bechtel Partner on 440-MW Ivanpah CSP Project Renewable Energy World, September 10, 2009. ^ "Concentrating Solar Power Projects - Ivanpah Solar Electric Generating System. Concentrating Solar Power. NREL". Nrel.gov. 2014-11-20. Retrieved 2017-12-12. ^ Wesoff, Eric; Brett Prior (April 25, 2011). "BrightSource Files for $250M IPO: A Closer Look". Greentech Media. Retrieved 2011-04-25. ^ Electric Power Daily (12 April 2011). "DOE finalizes $1.6 billion Ivanpah solar loan". Platts. Retrieved 3 December 2011. ^ a b Mufson, Steven (February 23, 2010). 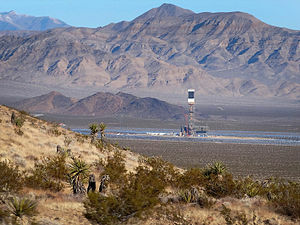 "Solar power project in Mojave Desert gets $1.4 billion boost from stimulus funds". Washington Post. Retrieved 2011-04-15. ^ Gupta, Poornima; Ayesha Rascoe (February 22, 2010). "California solar project gets $1.4 bln US guarantee". Reuters. Retrieved 2010-02-25. ^ Sadanand, Tejal (April 12, 2011). "Google goes green, invests $168 million in Ivanpah Solar power". International Business Times. Archived from the original on April 13, 2011. Retrieved April 15, 2011. ^ Google cans concentrated solar power project Reve, 24 Nov 2011. Accessed: 25 Nov 2011. ^ Google Renewable Energy Cheaper than Coal (RE<C) Archived 2013-06-29 at the Wayback Machine, Google. Accessed: 30 November 2011. ^ "CMB - EB5 Visa". Cmbeb5visa.com. Archived from the original on 2017-03-30. Retrieved 2017-03-29. ^ "High-Tech Solar Projects Fail to Deliver". One big miscalculation was that the power plant requires far more steam to run smoothly and efficiently than originally thought, according to a document filed with the California Energy Commission. Instead of ramping up the plant each day before sunrise by burning one hour’s worth of natural gas to generate steam, Ivanpah needs more than four times that much help from fossil fuels to get the plant humming every morning. ^ Danelski, David (21 October 2015). "It's not easy being green: Ivanpah solar plant near Nevada burns much natural gas, making it a greenhouse gas emitter under state law". Orange County Register. Santa Ana, California. Retrieved 23 October 2015. ^ Household energy Physics UCI. ^ a b c Danko, Pete (June 17, 2015). "Ivanpah Solar Production Up 170% in 2015". Breaking Energy. Retrieved 22 March 2016. ^ Energy Information Administration. "Electricity data browser - Ivanpah 3". Electricity Data Browser. Retrieved January 27, 2016. ^ "ORDER APPROVING a Petition to Modify SOLAR PARTNERS, LLC : Air Quality Conditions of Certification" (PDF). Energy.ca.gov. Retrieved 18 July 2018. ^ Zook, David (November 16, 2009). "County Supervisor, Concerned by BrightSource Mega Solar Project Impacts, Calls for Full Review". Best Syndication News. Retrieved 2011-04-15. ^ "DOE Finalizes $1.6 Billion Loan Guarantee for BrightSource Energy". U.S. Department of Energy Loans Program Office. U.S. Department of Energy. 11 April 2011. Archived from the original on 28 March 2014. Retrieved 28 Mar 2014. ^ Schlissel, David; Allison Smith; Rachel Wilson (July 2008). Coal-Fired Power Plant Construction Costs (PDF) (Technical report). Synapse Energy Economics, Inc. p. 8. ^ Schlissel, David; Bruce Biewald (July 2008). Nuclear Power Plant Construction Costs (PDF) (Technical report). Synapse Energy Economics, Inc. p. 9. ^ a b "NRG's Massive California Solar Plant Finally Making Enough Power". 1 February 2017 – via www.bloomberg.com. ^ a b Danko, Pete (December 15, 2015). "Ivanpah Solar Project Faces Risk of Default on PG&E Contracts". KQED. Archived from the original on 2016-03-25. Retrieved 22 March 2016. ^ Danelski, David (March 17, 2016). "PUC gives Ivanpah plant operators more time to increase output". The Press-Enterprise. Retrieved 22 March 2016. ^ Susan, Kraemer. "How Ivanpah Raised Its Performance In Its Second Year". CleanTechnica. Retrieved 17 June 2016. ^ "U.S. Solar Radiation Resource Maps". NREL. Retrieved 4 March 2014. ^ "Ivanpah Solar Electric Generating Station (ISEGS) Case Study". CleanEnergy ACTION PROJECT. Archived from the original on 2014-05-22. Retrieved 4 March 2014. ^ "Ivanpah Solar Electric Generating System". Retrieved 18 March 2014. ^ "Ivanpah Solar Project Quietly Goes Online – Or Does It?". KCET. 30 January 2014. Retrieved 4 March 2014. ^ a b Staff (19 May 2016). "Mirrors blamed for fire at world's largest solar plant". The Big Story. Associated Press. Retrieved 23 May 2016. ^ "Renewables Watch for Operating Day: Monday, June 20, 2016" (PDF). California ISO Renewables Watch. Retrieved 21 June 2016. ^ "Renewables Watch for Operating Day: Tuesday, June 07, 2016" (PDF). California ISO Renewables Watch. Retrieved 21 June 2016. ^ "PLANT OF THE YEAR: Ivanpah Solar Electric Generating System Earns POWER's Highest Honor - POWER Magazine". POWER Magazine. Retrieved 28 November 2014. ^ a b "The Ivanpah solar energy project named Concentrating Solar Power project of the year". REVE. February 22, 2012. ^ Lewis, Judith (4 May 2009). "As the climate warms, environmentalists square off over Big Solar's claim to the Mojave Desert". High Country News. Archived from the original on 2012-04-06. Retrieved 3 December 2011. ^ "California Energy Commission" (PDF). Compliance Docket - Ivanpah Solar. California Energy Commission. Retrieved 9 September 2014. ^ "Avian & Bat Monitoring Plan" (PDF). California Energy Commission - Ivanpah Solar compliance. California Energy Commission. Retrieved 9 September 2014. ^ DuHamel, Jonathan (22 August 2014). "Ivanpah solar plant wants to burn more natural gas". Arizona Daily Independent. ^ "Ivanpah Temporary Suspension Notice". Federal Government. Retrieved 3 December 2011. ^ California Energy Commission. "Final Staff Assessment of the Ivanpah Solar Electric Generating System". CEC Documents Page. CEC. Retrieved 3 December 2011. ^ Danelski, David (8 October 2011). "First displaced tortoise released". Press-Enterprise. Retrieved 3 December 2011. ^ Basin and Range Watch. "Desert Tortoise Recovery: Science and Politics Clash". Retrieved 3 December 2011. ^ a b Kaufmann, K. (2013-11-13). "Palen project raises concerns across Coachella Valley". mydesert.com. Retrieved 2014-02-17. ^ "Preventing Bird Deaths at Solar Power Plants, Part 1". Renewable Energy World. Retrieved 28 November 2014. ^ "Palen Solar Power Project - Compliance" (PDF). Docketpublic.energy.ca.gov. Retrieved 28 November 2014. ^ Knickmeyer, Ellen (18 August 2014). "Emerging solar plants in Mojave Desert scorch birds in mid-air". The Sun. San Bernardino County Sun. The Associated Press. ^ K Kaufmann (7 April 2014). "Birds going up in smoke at Ivanpah solar project". The Desert Sun. Retrieved 28 November 2014. ^ Peck, Morgen (2014-08-20). "Ivanpah Solar Power Tower Is Burning Birds". IEEE Spectrum. Retrieved 2014-12-07. ^ Kraemer, Susan (2015-04-16). "One Weird Trick Prevents Bird Deaths At Solar Towers". cleantechnica.com. Retrieved 2017-12-12. ^ Sweet, Cassandra (June 12, 2015). "High-Tech Solar Projects Fail to Deliver". Wall Street Journal. Once built, U.S. government biologists found the plant’s superheated mirrors were killing birds. In April, biologists working for the state estimated that 3,500 birds died at Ivanpah in the span of a year, many of them burned alive while flying through a part of the solar installment where air temperatures can reach 1,000 degrees Fahrenheit. ^ Peter Fairley, Solar towers don't seem to be the bird-destroyers once thought, IEEE Spectrum, 2 Nov. 2015. ^ Sahagun, Louis (September 2, 2016). "This Mojave Desert solar plant kills 6,000 birds a year. Here's why that won't change any time soon". Los Angeles Times. Retrieved 6 September 2016. ^ Kraemer, Susan (3 September 2014). "For the Birds: How Speculation Trumped Fact at Ivanpah". renewableenergyworld.com. ^ Zerkel, Eric (19 August 2014). "New Solar Power Plants are Incinerating Birds". The Weather Channel. Retrieved 6 September 2016. ^ Sahagun, Louis (2 september 2016). This Mojave Desert solar plant kills 6,000 birds a year. Here's why that won't change any time soon, LA Times. Retrieved 25 Nov. 2016. ^ a b "Electricity data browser - Ivanpah 1". Electricity Data Browser. Energy Information Administration. Retrieved October 22, 2017. ^ a b "Electricity data browser - Ivanpah 2". Electricity Data Browser. Energy Information Administration. Retrieved October 22, 2017. ^ a b "Electricidad data browser - Ivanpah 3". Electricidad Data Browser. Energy Information Administration. Retrieved October 22, 2017. Wikimedia Commons has media related to Ivanpah Solar Power Facility.